Background In a time-constrained clinical environment, physicians cannot feasibly document all aspects of an office visit in the electronic health record (EHR). This is especially true for patients with multiple chronic conditions requiring complex clinical reasoning. It is unclear how physicians prioritize the documentation of health information in the EHR. 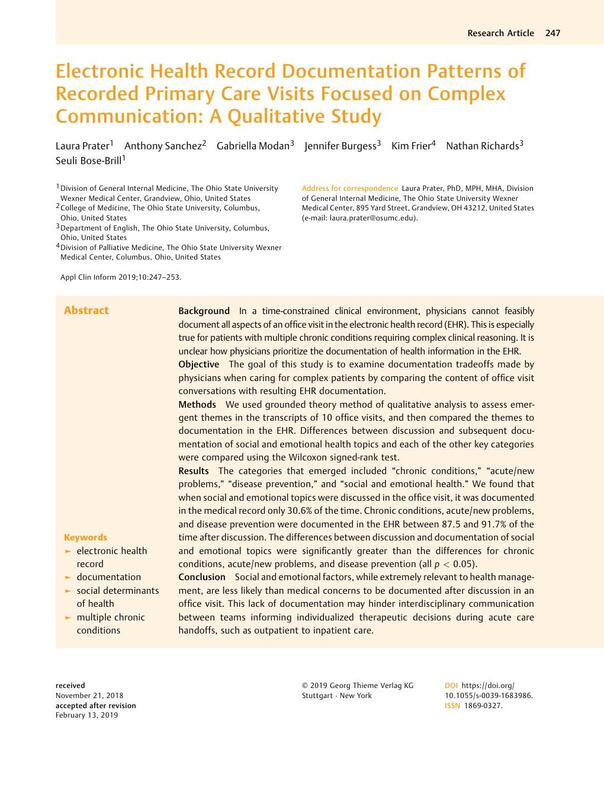 Objective The goal of this study is to examine documentation tradeoffs made by physicians when caring for complex patients by comparing the content of office visit conversations with resulting EHR documentation. Methods We used grounded theory method of qualitative analysis to assess emergent themes in the transcripts of 10 office visits, and then compared the themes to documentation in the EHR. Differences between discussion and subsequent documentation of social and emotional health topics and each of the other key categories were compared using the Wilcoxon signed-rank test. Results The categories that emerged included “chronic conditions,” “acute/new problems,” “disease prevention,” and “social and emotional health.” We found that when social and emotional topics were discussed in the office visit, it was documented in the medical record only 30.6% of the time. Chronic conditions, acute/new problems, and disease prevention were documented in the EHR between 87.5 and 91.7% of the time after discussion. The differences between discussion and documentation of social and emotional topics were significantly greater than the differences for chronic conditions, acute/new problems, and disease prevention (all p < 0.05). Conclusion Social and emotional factors, while extremely relevant to health management, are less likely than medical concerns to be documented after discussion in an office visit. This lack of documentation may hinder interdisciplinary communication between teams informing individualized therapeutic decisions during acute care handoffs, such as outpatient to inpatient care. This study was performed in compliance with the World Medical Association Declaration of Helsinki on Ethical Principles for Medical Research Involving Human Subjects, and was reviewed by The Ohio State University Institutional Review Board.